Low stool in solid teak and braided canework., ca. 1955- 1956. Chandigarh. 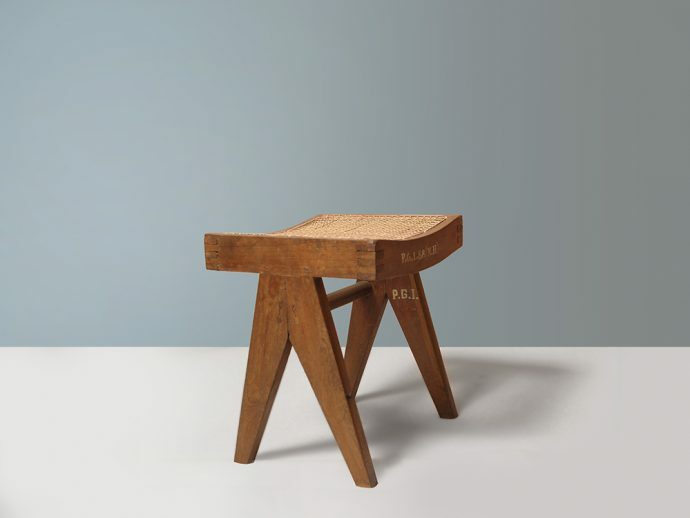 34 Stool Pierre Jeanneret designed Banch, banc Chandigarh PJ-SI-34-A . It is a fantastic object of design. The history of architecture let in India making a capital, where capitol and all great furniture objects got offered. We sell that kind of art in our P! galerie. That is our famous art exhibition like Miami Basel. So we try the best and that's it. Stool Jeanneret PJ-SI-34-A made of teak and tubular mesh. It is a piece of furniture with a piece of culture. The shape and the material combine. The brown wood and the reduced shape stand for a classic of modernity. These qualities are rare. The stool Jeanneret is unique and unfortunately already sold. Together with Charlotte Perriand, he created a collection of beautiful furniture in 1960. Life in Chandigarh was good. In India there would be a moment of departure. Design and sale of artifacts of the modern age bring an architecture that appeals to the architect. This world of style and world is significant. Tables and stools are important for every interior. Ingenious furniture and a wood that tells a story with the patina. These things make Jeanneret a collector's item. The auction houses and the museums are therefore striving to create a world of Berlin, Vienna and Munich. There is the sale in our P! Gallery. This is an exhibition history that is there. Exhibits of the Indian world. Punjab had a good university. These factors make design to art and us to gallery owners. These products 34 stool are rare and expensive.